Asparagus is one of the world’s healthiest foods and a favorite low calorie, nutrient dense snack of many. Delicious raw or cooked, asparagus is commonly found in kitchens as a multipurpose ingredient used in salads, juices, main courses in more. Due to its incredibly health benefits, I often wonder if asparagus is safe to share with my dog, as well. I decided to conduct some extensive research on the super-food, and discover once and for all if dogs can eat asparagus. Verdict: Asparagus, in moderation, is a welcome addition to any dog’s diet! Asparagus can safely be given to your dog as a treat or simply as a nutritious snack. The veggie can be served raw or lightly cooked, and can provide an array of health benefits to your dog. As one of the words healthiest foods, asparagus is absolutely loaded with vitamins and minerals. It is an excellent source of vitamin K, folate, copper, vitamin B1, selenium, vitamin B2, vitamin C, and vitamin E. Asparagus is also a good source of manganese, phosphorus, vitamin B3, potassium, choline, vitamin A, zinc, iron, protein, vitamin B6, and pantothenic acid. Asparagus’ complete vitamin and mineral profile will help ensure that your dog stays and looks healthy, promoting proper immune and organ function as well as healthy skin, teeth, eyes and coat. Selenium, often supplemented in high quality dog foods, is hailed for its ability to prevent cancer, cardiovascular disease, cognitive decline, and thyroid disease. Many of the vitamins in asparagus boast antioxidant properties and assist with immune health and warding off chronic diseases like type 2 diabetes, heart disease, and even cancer. One antioxidant in particular, glutathione, is exceptionally adept in combating free radicals that damage healthy cells and lead to inflammation, arthritis, and cancer. Asparagus, high in dietary fiber, is an excellent way to maintain digestive health in your dog. 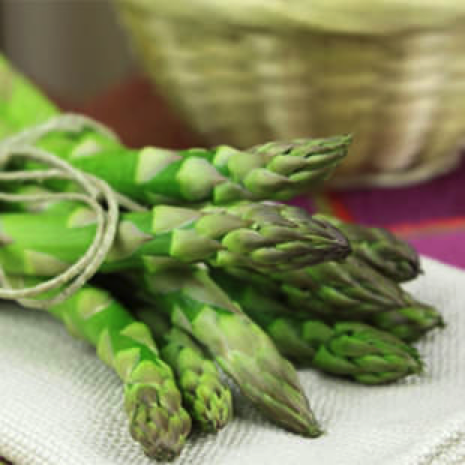 For dogs dealing with constipation, asparagus can help induce regular bowel movements. Fiber also adds to the bulk of the food, causing fullness quicker. This means asparagus can also be used to assist a dog struggling with weight gain or one recently placed on a diet. The end of the asparagus spear is the most fibrous part of the vegetable. Asparagus is also an excellent source of inulin, another ingredient that is often supplemented in high quality dog foods. Inulin is a unique carbohydrate that, once it arrives in the large intestine, becomes a digestive aid known as a prebiotic. Prebiotics are excellent food sources for healthy bacteria that coat the digestive tract. These bacteria are essential to nutrient absorption and the reduction of allergies, and also lower the risk of colon cancer. If you are the proud owner of an asparagus plant, be sure that your dog does not snack on the leaves. Asparagus ferns, the inedible portion of the asparagus plant, are toxic to dogs and cause moderate to severe intestinal discomfort, vomiting, and diarrhea. While most likely not lethal, asparagus ferns can cause some serious pain for you dog, and you should contact your family veterinarian immediately if ingested. Asparagus stalks are extremely tough, even tough enough to be used as a chew toy if you are certain your dog will not attempt to swallow the stalk whole. Due to its difficulty to chew, some dogs may attempt to swallow even small pieces whole as opposed to chewing them up first. While asparagus can certainly be enjoyed raw, many veterinarians recommend cooking asparagus lightly before serving to your dog in order to increase digestibility and to decrease choking hazards. Keep in mind that cooking vegetables will decrease their nutrient value, so it is best to keep cooking times to a minimum. If you, like me, are a fan of asparagus, then you are likely well acquainted with the unique odor the veggie can impose on your urine. Well, dogs are susceptible to asparagus’ aromatic powers as well. More than a tiny amount of asparagus can cause your pup to have some extremely odorous urine, and possibly even green stools. There is no definitive answer to why this happens, but we know that it is not a cause of concern. Although, if your dog is not housetrained, you may want to hold off on the asparagus until it is. You don’t want a horror story of asparagus scented urine plaguing your house for days on end.